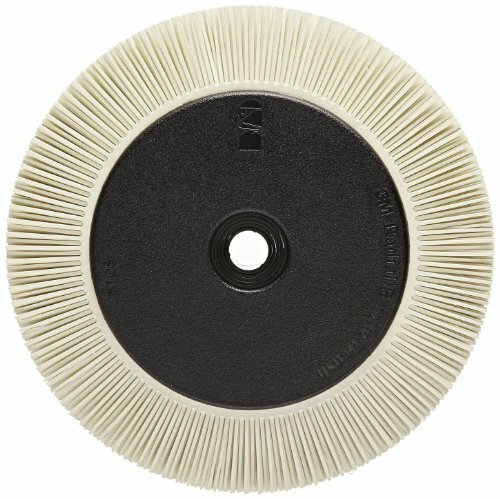 3M durable radial brushes can be used to replace wire brushes. Cleans with minimal pressure. Works on a variety of coatings and is a safe alternative to wire brushes. Abrasive mineral: aluminum oxide and Cubitron abrasive grain. 1-1/4-inches center hole diameter. Converted form: bristle brush. Equipment - machines: bench motors. Form type: radial bristle. Max RPM: 6000. Best position. Made of aluminum oxide. Measures 1-inches width by 8-inches diameter. 120 Grit. White color.